Rain this morning gives way to a decent evening, while Sunday through much of the work week ahead looks to be dry with nice temperatures. 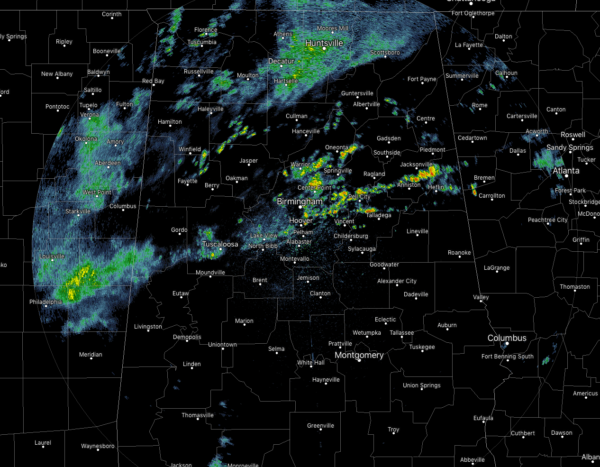 As we take a look at radar as of 6:06 a.m., we see some spotty shower activity over the north and central parts of the state, with the leading edge of the activity stretching from Aliceville to Hoover to Heflin. All of these showers are moving rather quickly off to the east near 40 mph. Temperatures across central Alabama are in the upper 50s to the lower 70s. Birmingham was at 68 degrees at this point. TODAY: We have a boundary working through central Alabama today that will bring us some light shower activity through the area. The good news is that it looks like the showers will move through rather quickly and be out of the Tuscaloosa, Birmingham and Gadsden areas by 2 p.m., and will be out of the southeastern parts of the area by sunset. Afternoon highs top out in the mid 60s to the upper 70s from north to south. Get ready for a chill in the air, as overnight lows will make it down into the 30s and 40s, by far the coldest we’ve seen so far this season. FOOTBALL WEATHER: For the Alabama-Tennessee game in Knoxville, there may be a lingering shower during the first part of the game, but skies will begin to clear out for the second half. Temperatures at the 2:30 p.m. kickoff will be in the mid-60s, falling into the lower 60s by the final whistle. For the Auburn-Ole Miss game in Oxford, it will nearly be the same story as up in Knoxville. A lingering shower is possible during the first quarter, but skies start clearing after that. Temperatures at the 11 a.m. kickoff will be in the lower 60s and warming into the upper 60s by the end of the game. It’s homecoming for the UAB Blazers as they take on North Texas tonight at Legion Field. It will be a great night for college football, with clear skies throughout the game. Temperatures will be in the mid 60s at the 6:30 p.m. kickoff and fall to near 60 degrees by the end of the game. SUNDAY: We’ll be on the backside of the trough on Sunday as the center of low pressure will be moving off of the north Atlantic coast, and a ridge is starting to build just off to the west. This will start a stretch of wonderful weather across central Alabama with sunny skies and mild temperatures. Highs will be in the upper 50s to the mid 60s across the area with overnight lows dipping even colder into the mid 30s to the lower 40s. The colder spots could easily drop below freezing for a little while just before sunrise on Monday morning. THE WEEK AHEAD: Nice weather is expected for a little while. Look for sunny skies with highs warming back up into the mid 60s to the lower 70s for Monday. On Tuesday, we’ll have a good bit of sunshine for the northern half of the area, while it will be partly to mostly cloudy for the southern half as the flow goes zonal. That will keep a disturbance to our south. Highs will warm back up into the lower 70s. It’s nearly the same story for Wednesday, as we’ll have a good bit of sunshine with a few clouds, and highs in the upper 60s to the upper 70s. There will be a weak surface boundary that will be pushing through the area on Thursday with a center of low pressure off to our southwest. 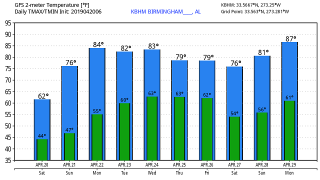 On previous model runs it was trying to move some moisture up into central Alabama, but the latest runs of the Global Forecast System and the European model are agreeing that shower activity will stay well south of us. At this point, we’ll go with mostly cloudy skies with highs in the mid 60s to the lower 70s. On Friday, it looks like a disturbance will be moving off of the southeastern Texas coast and making a path to the northeast that will bring some shower activity to the area during the afternoon and into the evening and overnight hours. Highs will once again be in the mid 60s to the lower 70s. Next Saturday may be a pretty wet day across the area as that disturbance continues to move northeastward, but that’s out in Voodoo Land at this point. 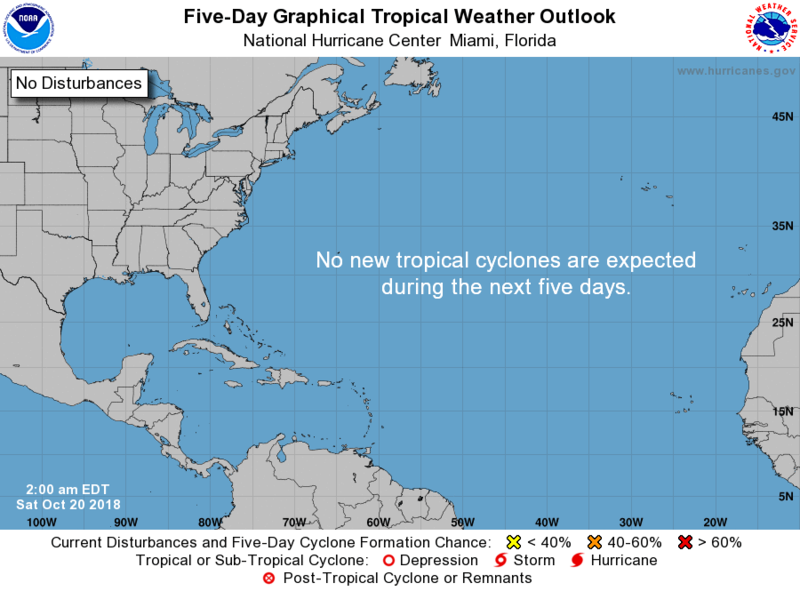 TROPICS: The tropics are all quiet at this point, and nothing is expected to form in the Atlantic Ocean, Caribbean Sea or the Gulf of Mexico through the next five days. For more weather news and information from James Spann, Scott Martin and other members of the James Spann team, visit AlabamaWx.